The car is so “old” now that it took me a really long time to find any information online. I eventually tracked down some audio Y-cable with the appropriate molex connectors, but I couldn’t source one conveniently, and it wasn’t clear to me if or how it would even work – two amplifiers driving a speaker sounds like a bad idea. 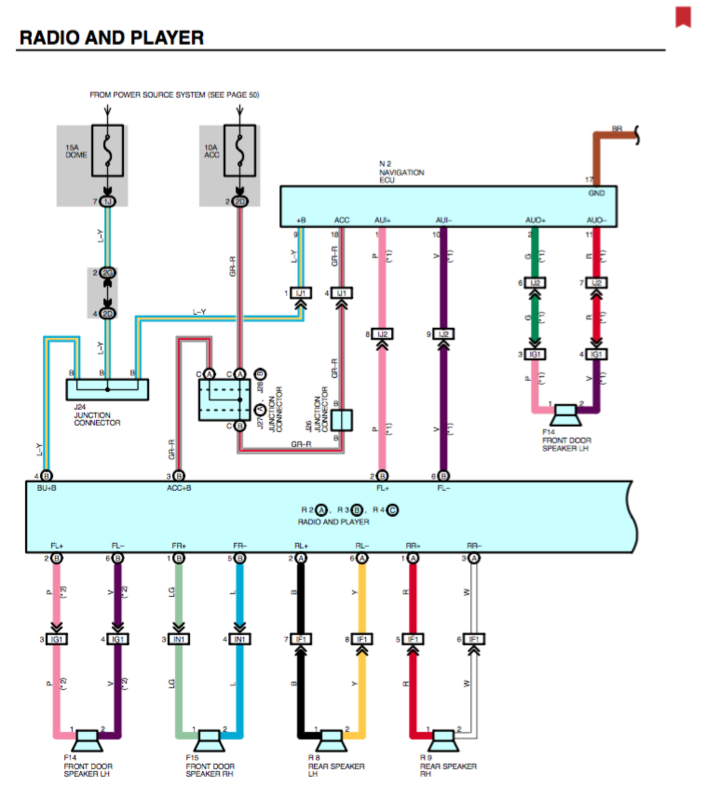 The full electrical wiring document can be downloaded here: Prius Electrical Wiring.pdf (PDF, 7.6MB). On page 152, above, is a diagram of a connector labelled: ‘R2A,R3B,R4C RADIO AND PLAYER’. This represents at least three physical connectors (R2A, R3B, R4C) going into the back of the stereo. The speaker cables are clearly marked by colour and connector pin number. I found it easier to just stick to colour to identify them. The rear LH speaker is black and yellow, for example. You must – getting the polarity correct! 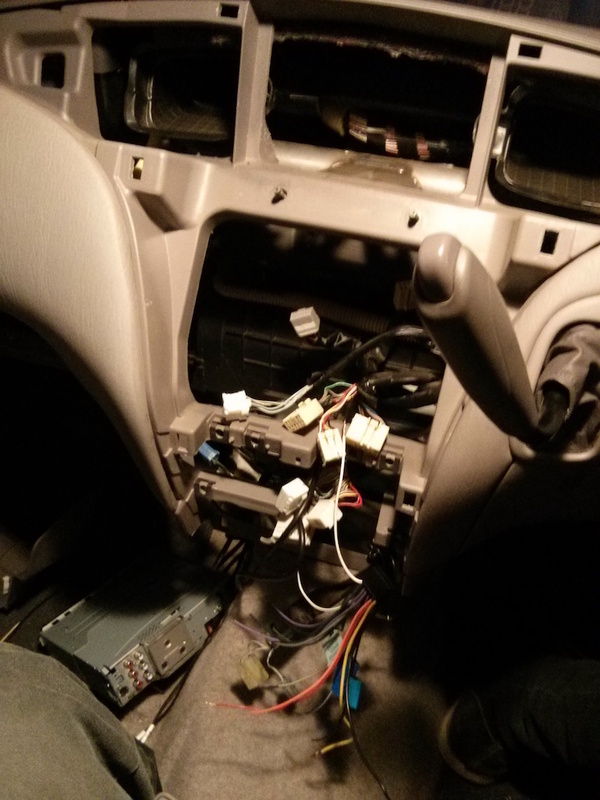 – simply cut each wire before it enters the prius unit, and connect it to the relevant JVC cable out of the JVC connector. Sometimes the colours match up but mostly they don’t. In this way, you will connect 8 wires to the four speakers. 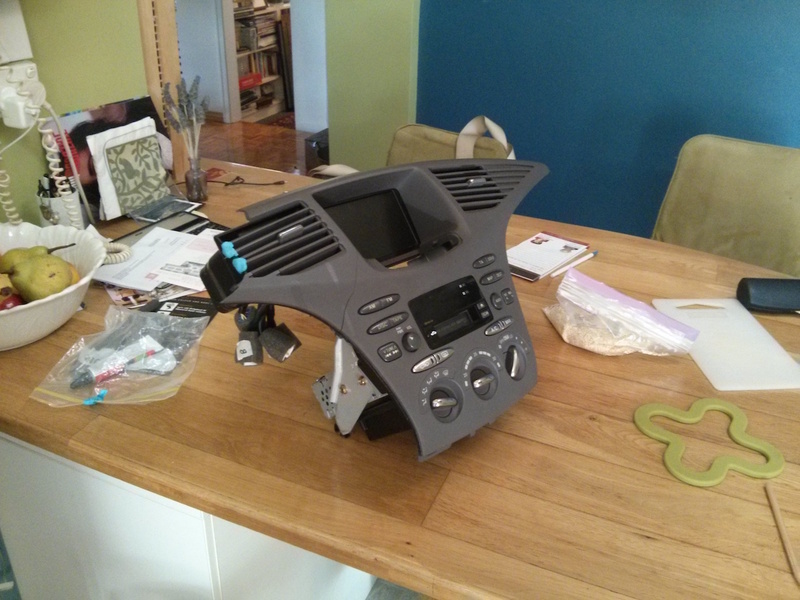 Then, the only things remaining on your head unit are BATT, ACC, a headlight signal, and of course the radio antenna (which just unplugs from the prius unit and straight into the JVC). I thought that the 12V ‘batt’ supply on that connector looked a bit wimpy so I picked it up from the cigarette lighter socket, which had a much thicker wire going to it. It’s probably fused at 20A or more. You probably don’t need to – I just didn’t want to go back in again. The ‘ACC’ cable (‘Accessory’) into the JVC unit simply provides the unit with a 12V signal that tells the JVC unit that the car is powered up. I picked this up on the wire marked ACC+B. You might want to confirm this with a multimeter. 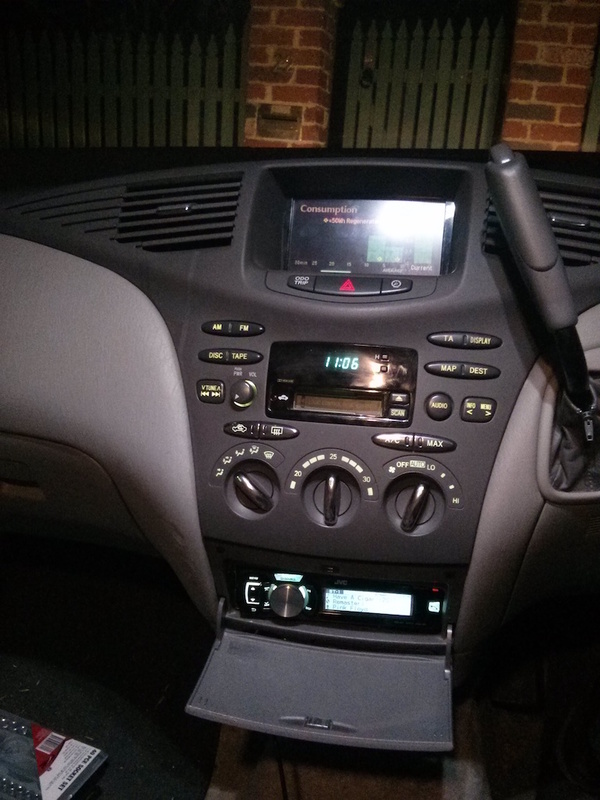 The JVC unit also has an input that lets it know when the car headlights are on (so it can dim the LCD and button LEDs) – again, another 12V signal into the JVC unit. I simply picked this up from the cigarette tray lamp, which is of course only lit when the headlights are. You are connecting up in parallel to that lamp, so connect your wire, in parallel, to the positive side of that lamp (and leave the present wiring intact). That’s it! It is very easy to route the cable for the microphone, and I stuck the USB cable and bluetooth dongle (and Aux inputs etc) in the passenger glovebox compartment. Some cable ties will make sure it all stays solid. I recommend printing off both the JVC wiring diagram and the prius one, in colour, and just sitting in the seat working through it methodically and slowly. Double-check all your work before you power the car back on. You might want to disconnect the 12V battery (in the boot) to avoid accidentally dispatching fuses. If you attempt this, you should know that removing the dash is more than likely to result in it cracking. The plastic is old and deteriorates in the heat/sun. It’s held in place by pressure clips and no matter how carefully you prise it off, something’s gonna snap. I was able to repair mine with epoxy but you can see a hairline crack near the AC vents. In my case this doesn’t really bother me. Can I have your contact to asking for more? Ths! !